It's a sauropod, a brother to the more well-known Apatosaurus, Brachiosaurus, or Diplodocus. Here's the cool thing that links the two: the Patuxent River Agate is petrified dinosaur bone. I've got a couple of shark's teeth picked up nearby, but I need to get me one of these. But first I need to find someone who could actually identify it for me! Kjersti is my pick for top pic. A bikini is a bikini, organic cotton or not. Impressed as I am with the symbolism of the cheerleader's calendar, I'm actually impressed with the team's effort. If we all chip in, we'll make a dent, you know. Did you know there's going to be an annular eclipse on January 26? An annular eclipse (not as exciting as a total eclipse) will take place over the Indian Ocean on Monday, January 26. The track pretty much avoids land; only the end of the track goes over Sumatra, Java, and Borneo. I'll have to look for post-eclipse satellite images of the shadow. The reason I follow eclipses is that I've never seen a total eclipse, though I have seen an annular eclipse. It's a long time to wait until August 21, 2017, but that's really the next best chance. I don't think I can swing a trip to China this July 22, and besides, the air pollution there will make finding decent clear skies difficult. The next one (July 11, 2010) goes over the Southern Pacific; November 13, 2012 barely ticks northern Australia (but combining an eclipse trip with a Great Barrier Reef visit would sure be a great travel itinerary); there isn't another one until March 2015, over the North Atlantic (the only way to see that one would be on an airplane, because of the clouds); March 2016 goes over Indonesia and into the Pacific; and then we're at August 21, 2017. This was a pretty amazing article. I've been familiar with the ways in which the oceanic carbonate system maintains its balance, or gets knocked off kilter (absorption or degassing of atmospheric CO2 or dissolved CO2; biomineralization, i.e. calcification, by corals, coccoliths, foraminifers, pteropods and heteropods; organic matter remineralization in the deep sea; dissolution of calcium carbonate sediments; even the shift in the Ca/Mg balance as waters rush through the deep-sea hydrothermal systems) -- OK, fine, but I never heard of piscine "gut rocks" before!! "By drinking salt water, fish ingest a lot of calcium, which needs to be removed - or they will get renal stones," says Christensen, an associate professor in the UBC Fisheries Centre. The team discovered that fish do this by binding the calcium to bicarbonate, and then excreting it as pellets of calcium carbonate, a chalk-like substance also known as "gut rocks," in a process completely separate from food digestion. As the calcium carbonate from these pellets dissolves, it turns the seawater more alkaline, which has relevance for ocean acidification, and is impacted by the ocean's exchange of carbon dioxide (CO2) with the atmosphere." " - Wilson estimated the total biomass of bony fish in the world's oceans as between 812 million and 2050 million tonnes, leading to a total carbonate production of around 110 million tonnes. " Now, there MUST be pictures of gut rocks on the Internet. Let's go find 'em. Took me a few minutes, but I found the following. Also has another good reference. The problem is, previous studies have shown that only about 5% of the carbon generated by the enhanced productivity actually exits the surface ocean and sinks into the deep ocean (as organic carbon, detritus or fish/zooplankton poop). All the rest of the carbon gets recycled -- fish and zooplankton get fatter -- and when they get et and pooped, the carbon just gets "remineralized" by bacteria back into inorganic dissolved carbon, which then slightly shifts the oceanic carbonate and bicarbonate ions a bit such that the ocean waters with more carbon release it back into the atmosphere. The ocean conserves its carbon and is very efficient at it. So iron fertilization might be good for fishing, if you catch the fatter fish. The problem with that is fish have learned where to go to get more food, and they don't stay in one place. They migrate (which is why bluefin tuna are such fast, efficient swimmers). That's why the Grand Banks system produced so much cod -- they followed a seasonal cycle of reproduction and growth. Bottom line: iron fertilization is not a viable geoengineering solution for increasing atmospheric carbon dioxide. OK, even though the Baltimore Colts were my only hometown team, I am interested in how the Ravens do every year -- and they exceeded expectations considerably. I thought the Steelers would win, though, and they did. Thankfully Willis McGahee can still walk and talk. Being the ultimate fan of the underdog (see "Wustest to Fustest" about the Tampa Bay Rays), I thought the Cardinals would lose to the Eagles. They showed pluck coming back after falling behind, and they've got offense. With Warner on target to the incredible Fitzgerald and Boldin, and the running game working, they can move down the field. So now for the Super Bowl prediction. Forget that point spread stuff. Super Bowl history has shown that the team with the dominant defense should be favored (think the '86 Bears, the 2000 Ravens, the year that Tampa Bay won, even though my favorite player that year was the unfortunately retired Mike Alstott). So I think the Steelers, with this year's most dominant defense, should be favored. But I think the Steelers have enough rings and Super Bowls. So I hope that the luckless Cardinals finally get their chance. Besides, Pittsburgh fans will be beyond insufferable if they win another one. Alright, I can't believe I found out that Stacy Marie Fuson was on Momma's Boys after she was off the show. I also can't believe that this honey is still looking for a man to settle down with! And she even brings beer to the party! (Note: WhosDatedWho says that Stacy dated Charlie Sheen -- doesn't make her very unique -- and Edward Furlong (Terminator II). She's into sports (note the link), and more than a few sports stars have scored others who feature the same line in their resume: Lisa Dergan (Scott Podsednik), Carmella DeCesare (Jeff Garcia), Carrie Stevens (John Elway, though it didn't last), Julia Schultz (Brett Tomko), Laura Cover (Aaron Boone), Alicia Rickter (Mike Piazza), to name a few (and there's more than a few more). There's also Anna Benson, who doesn't have the line in her resume but was pretty famous anyway. I posted this site over on The Intersection (also in My Blog List), but I think it's worth a repeat. The weird thing is, there are only a few other susceptible continental areas on other continents if sea level rise. We all knew that Venice would become an snorkeler's paradise, but there's hardly any place in South America that would be affected, or Australia. (The islands in the Pacific, well, more snorkeling...) And you can pretty much write off Bangladesh. The question is being raised; are we in (or on the verge of) a depression? We certainly aren't near the Great Depression-levels of unemployment; but this article makes the case that we're closer than the numbers make it seem. OK, so here's the deal. Quick statement: the only thing that really ended the Great Depression was U.S. involvement in WWII -- first as an arms supplier to other countries, and then as a involved party. There were jobs for everyone -- unfortunately that some of those jobs meant getting shot at and killed, or killing other people. To get out of this one, we need a war effort. We need major conservation (remember rationing? if you don't, read some histories of WWII at home) and re-industrialization. So, Jimmy Carter declared a war on energy in the late 1970s; and it didn't work. The Great Barometer has made noises like that recently, too. He can keep driving the point home that we need to get serious. If we fight the energy war right, we can win. Conservation and new technology; Americans can make the most fuel-efficient cars on the planet, wind turbines, and a lot more houses that produce energy instead of squandering it. I'm on board. Plus in this war you don't have to get shot at, so I like it a lot better. I think it will turn out that the actual story is more compelling than the movie; January is traditionally where studios park big-budget movies that didn't meet expectations. Now, according to reports, it was in limited release in December to qualify for Oscars; checking Rotten Tomatoes, it only scores 48%. Doesn't sound like it will be as compelling as it should be. But those radio ads sure SOUND good. 2. My hometown Baltimore Ravens (actually, growing up in Baltimore, the Colts were the hometown team: nice to see the tributes to the greatest games ever played) are doing pretty good. So how come intercept-returner extraordinaire Ed Reed didn't get the Defensive Player of the Year? Beats me. OK, there ought to be an award for most defensive highlights in ESPN's Top Ten plays. Reed walks (er, runs) away with that one. OK, so heck I vowed not to talk much about professional sports (note that I include BCS football). But I still watch them on TV. So sue me. Not that anyone reads what I say anyway. Gives me the freedom of creative anonymity. Question: Whatever happened to Maria Gracia Cucinotta? She turned 40 this year. More on that later. Of the choices, I like Eberswalde, an ancient delta. Click this pic to go to Malin Camera's Web site and see it full size. But... there's a better place. It's the site of a hydrothermal system or even a hydrothermal explosion crater (at least that's what it looks like). It's called Dao Vallis. It's on the side of a volcano: Hadriaca Patera. What it looks like is a hydrothermal explosion crater that drained down the side of a volcano. Hydrothermal = hot springs = warm water = prime location for extremophiles. Dao Vallis is the basin and channel system on the left. Another system, Niger Vallis, starts a bit higher on the volcano slope and the drainage channel joins the channel of Dao Vallis. There's a third channel further to the right. 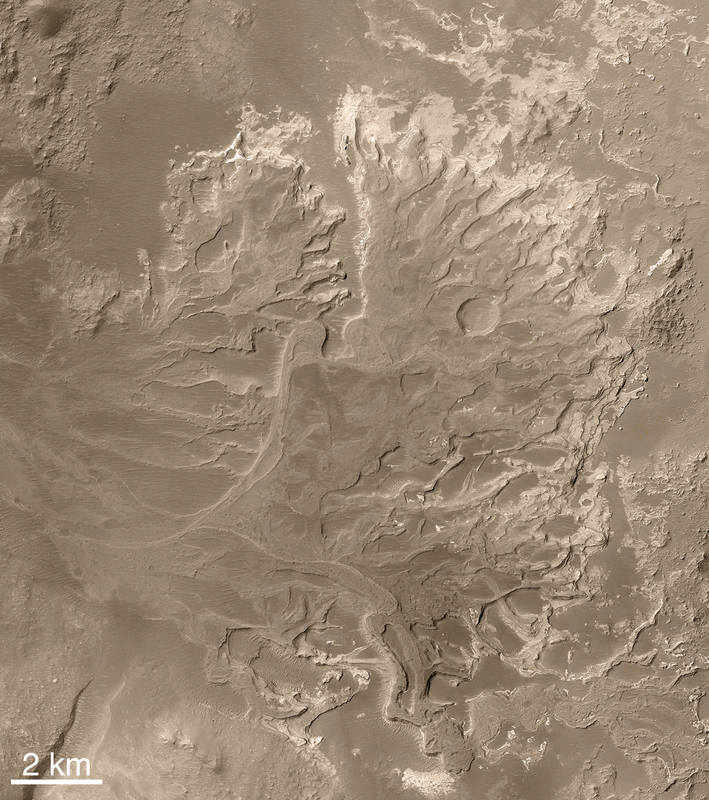 Go here to see a big 3D image from the European Mars Express orbiter. Go to the page and click the picture links, and you'll see BIG pictures. When you look at this particular image, in the depression where Dao Vallis originates, there are bumps. These could be hydrothermal mounds, formed underwater like the mid-ocean ridge hydrothermal vents, zones of proliferous life in otherwise barren abyss. Or they could be something formed in shallow warm waters -- huge fossil stromatolite mounds. In either case, these are prime targets. In my book, there's no second choice. This is where to land. Speed camera controversy in D.C.
" "In that area, it is a divided highway -- there are no more pedestrians, there are no more traffic lights, you are headed out of Washington, and right there the speed limit is 40 miles per hour. But go a little farther and it is 55 miles per hour," Anderson says. "It makes no sense unless you want to make lots and lots of money." D.C. Police Chief Cathy Lanier tells WTOP the camera along New York Avenue is in place for traffic safety reasons and is designed to reduce speeding. "Bottom line: don't break the law and you don't get a ticket." D.C. Councilmember Harry Thomas Jr., (Ward 5), whose district includes New York Avenue, spread a similar message. "If a driver starts picking up speed before Route 50 or the BW Parkway, that may be an indication how the driver is going to travel down that road," Thomas says. "I haven't heard a lot of complaining about that device, in fact, folks say traffic calming measures are needed more in areas." Unlike Montgomery County, the District does not tell drivers how many mph above the posted speed limit they have to be traveling in order to get their picture taken by a speed camera. If a drivers gets a fine from a speed camera in the city, it can range up to $200, depending on how fast the driver is going. That's exactly my plan! Make money on speeders! Use the money from speeders on infrastructure! OR: more likely, after getting hit with a few speeding fines, the speeders will start to slow down pretty drastically (especially in this economy). Result: safer roads, less money spent on useless patrol car radar speed enforcement (which is clearly ONLY a revenue device, because it has no deterrent effect whatsoever), less traumatic crashes, less use of Medevacs that sometimes crash and accidentally kill the people they're trying to save -- overall, either you get revenue or you save revenue with substantial deployment of mobile speed cameras. OHHHH, I know I'd get nailed too. It's just too tempting to go over the speed limit on Route 4 or Route 4&2 (look at a map and see what I mean) trying to get anywhere in this county. But of course, they aren't interstates, so they wouldn't be big revenue streams. I'm safe (for now). Anderson says more oversight of the program is needed. "AAA wants these cameras in use for safety purposes, but when you put them in places like New York Avenue, across from the National Arboretum, where you are making tons of money and doing absolutely nothing for safety, you are just picking motorists pockets." Lon, you're picking the pockets mostly of motorists who are A) breaking the law and possibly B) dangerous aggressive drivers. OK, some stuff is just plain interesting. Sorry I can't be witty, I just found this an article indicating that there is still a lot of science to be done out in the big wide world. "Zhao said the discovery of so many dinosaurs in such a dense area could provide clues on how the animals became extinct towards the end of the Cretaceous period 65 million years ago, the Beijing News said." "Included in the find was the largest "platypus" -- or "duck-billed dinosaur" in Chinese -- ever discovered measuring nine metres high with a wingspan wider than 16 metres, the report said." I thought the duckbills were Jurassic, not Cretaceous. And, uh, "wingspan"? Most of the other stuff is based on the single Beijing News article. The Australian picked up on the "platypus" word, apparently missing that it was really a duckbill. Have to wait until National Geographic runs something on this to get the good word (even though they were duped by some forgeries awhile back).